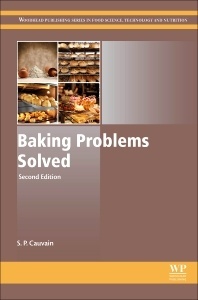 Baking Problems Solved, Second Edition, provides a fully revised follow-up to the innovative question and answer format of its predecessor. Presenting a quick bakery problem-solving reference, Stanley Cauvain returns with more practical insights into the latest baking issues. Retaining its logical and methodical approach, the book guides bakers through various issues which arise throughout the baking process. The book begins with issues found in the use of raw materials, including chapters on wheat and grains, flour, and fats, amongst others. It then progresses to the problems that occur in the intermediate stages of baking, such as the creation of doughs and batters, and the input of water. Finally, it delves into the difficulties experienced with end products in baking by including chapters on bread and fermented products, cakes, biscuits, and cookies and pastries. 1. Introduction to Problem-Solving Techniques 2. Raw Materials 3. Key Relationships Between Ingredients, Recipes and Baked Product Qualities 4. Bread and Other Fermented Products 5. Cakes, Sponges and Muffins 6. Biscuits, Cookies, Crackers and Wafers 7. Pastries 8. Other Bakery Products 9. Processes and Equipment 10. Testing Methods 11. What? Prof. Cauvain is owner of BakeTran, a renowned independent Baking Industry Consultancy in Witney, UK. He was a director of Cereals & Cereal Processing Division at CCFRA until December 2004. A leading authority in the bread and baking industry, Stanley was also President of the International Association for Cereal Science and Technology between 2004 and 2006. He is a frequent Woodhead Publishing Limited author having written or edited six titles previously.